Sara Low is a New York State licensed fishing guide and fly fishing instructor with 20 years experience organizing and leading fishing trips for novice and experienced anglers. She is a founding partner of High Spirits Unlimited, a travel company devoted to fly fishing trips. Off the water, Sara published a how-to fishing book, A Guide’s Guide to Fly Fishing, and is working on her next. 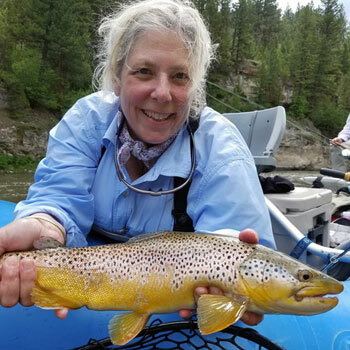 She co-chaired the Fly Fishing Hall of Fame and has served as a director of organizations including Theodore Gordon Flyfishers, a not-for-profit angling organization promoting river protection, and Juliana’s Anglers, a fishing club for women. She curated an award-winning exhibit on “The History of Women in Fly Fishing” and was honored by the Catskill Fly Fishing Center and Museum as the 2010 Outstanding Flyfisher of the Year. She has been the subject of articles in publications from here to Japan, including The New York Times and Brown Alumni Monthly and featured on television programs such as WNBC’s “Today in New York” and The Outdoor Channel’s “Red Hook Outdoors.” Currently President of the United States Croquet Association and a former executive in entertainment advertising, Ms. Low is thrilled to be introducing anglers to the joys of fly fishing.